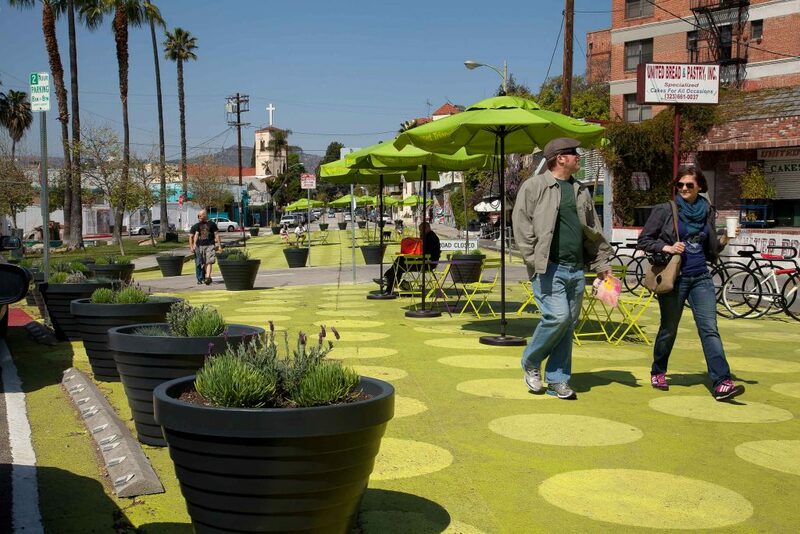 Cities like Los Angeles are in need of more active and vibrant public space. But in land-strapped cities with limited public space, what if you could convert underutilized streets into just that? Enter People St, an initiative of the City of Los Angeles Department of Transportation (LADOT) in collaboration with the City of Los Angeles Departments of Public Works and City Planning, the Office of Mayor Garcetti, and the Los Angeles Metropolitan Transit Authority (Metro). 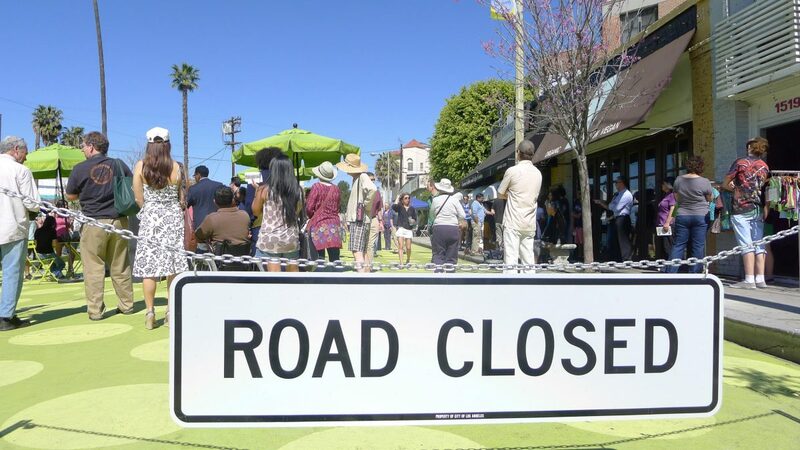 In March 2012, Sunset Triangle Plaza debuted as the program’s first pilot project, taking an underutilized public right of way located at Griffith Park Boulevard and Sunset Boulevard. The one block stretch of street has been transformed from a car-centric artery into a safe, pleasant, and vibrant public space for pedestrians and cyclists alike. 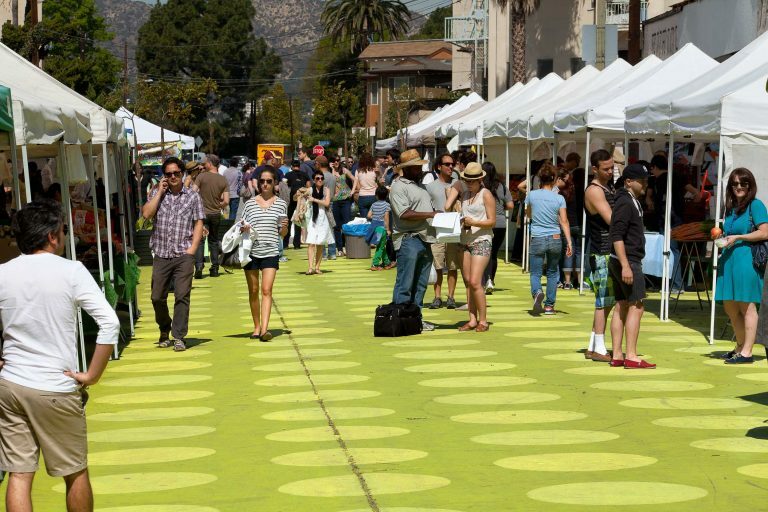 A key concept of the People St program is to quickly and inexpensively reclaim under-used street space and involve local residents and businesses in the design and maintenance. 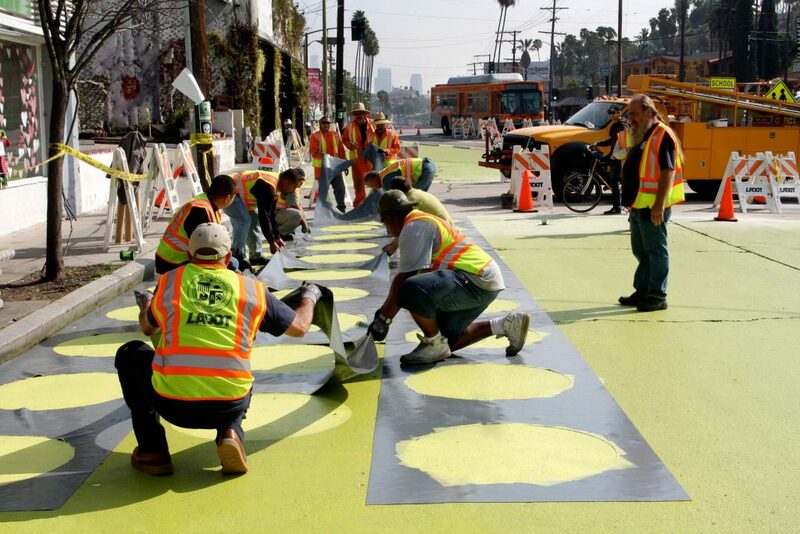 The use of simple materials – in this case paint and planters – allowed the program to recapture streets for people in months rather than decades, and for thousands rather than millions of dollars. 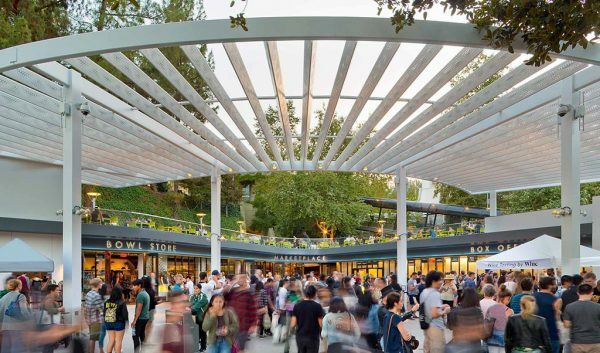 The Sunset Triangle Plaza acted as a pilot project to create a process, template, and system of cooperation between city departments and the community. The project established guidelines and methods for expansion throughout the city, which immediately allowed four other pilot Parklets to crop up around the city. Sunset Triangle Plaza is outlined by rows of planters working as bollards to demarcate the 11,000 square foot site. 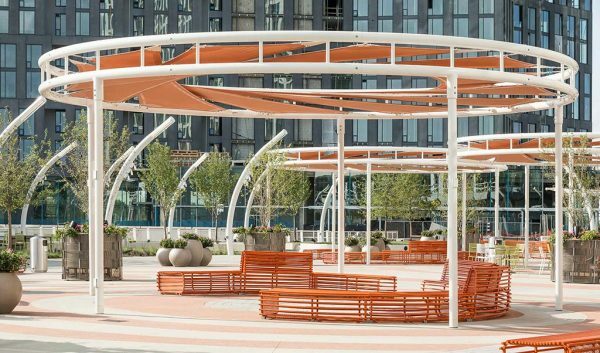 In addition to planters containing drought-tolerant and low-maintenance plants, moveable bistro tables with umbrellas and chairs, and a whimsically painted street surface create a community atmosphere and a respite in the middle of a busy neighborhood. 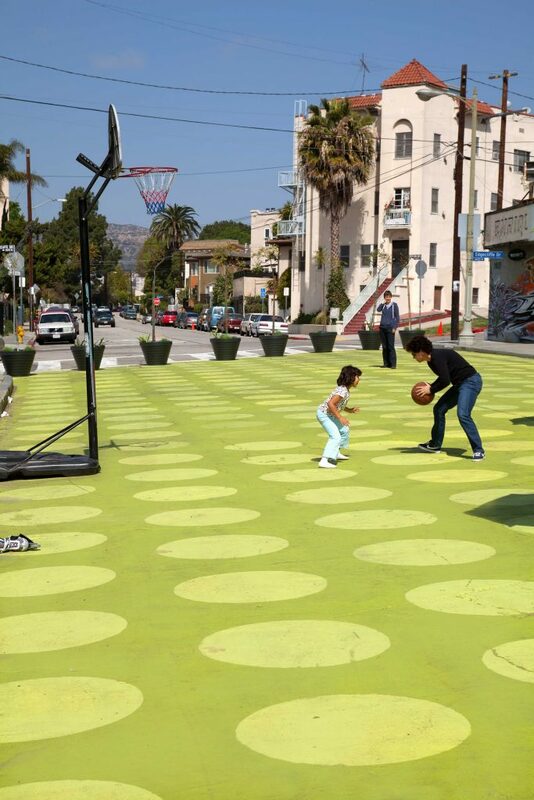 The use of simple materials – in this case paint and planters – allowed the program to recapture streets for people in months rather than decades, and for thousands rather than millions of dollars. 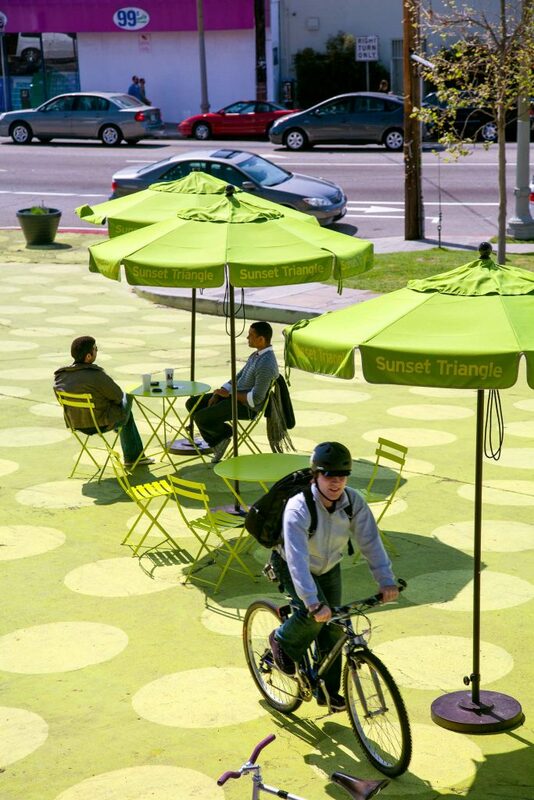 Literally a “green space,” the Sunset Triangle Plaza surface is painted in two tones of green in an enlarged polka-dot pattern. The playful dots are open to interpretation, but our concept was inspired by the pre-digital printing process. 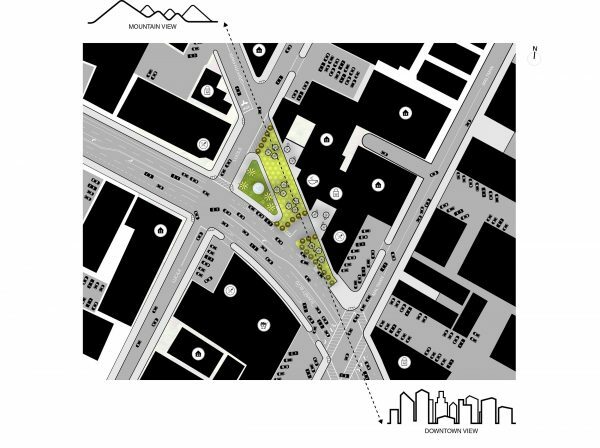 In that process, dot patterns are created called halftones, and Sunset Triangle Plaza represents a site in transition—a halfway point—from street to plaza. This temporary pilot is now on its way to becoming a permanent public plaza, designated for removal from the City of Los Angeles Bureau of Street Services. The People St Initiative is working with local community and business interests to provide oversight, programming, and maintenance. At this location, the twice-weekly farmer’s market continues to operate uninterrupted and all street furniture is brought inside each evening to maintain its quality and cleanliness. 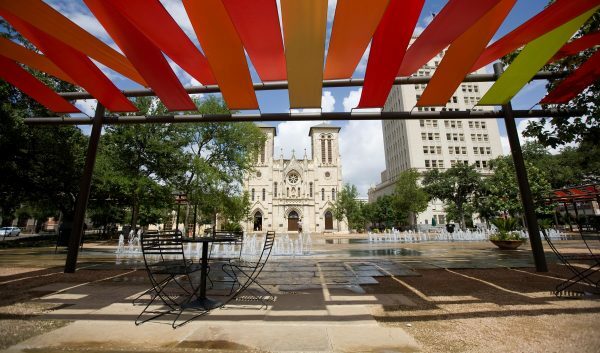 The pilot project was meant to last for one year, but remains in place today and the neighborhood has even added programming such as a movie night and other events — a testament to the success of reclaimed public spaces.